The Doctor and her friends uncover Jeff Bezos’ next plan is a bit more sinister than just a more expensive prime delivery. There’s a moment in “Kerblam!” where Jodie Whittaker’s Doctor does something she’s never done before, but her past selves have. She barges into a scene and demands answers, lest the villain of the week face her wrath. After, she asks her companions if the bombast suited her—and it almost felt like she was asking the audience, too. 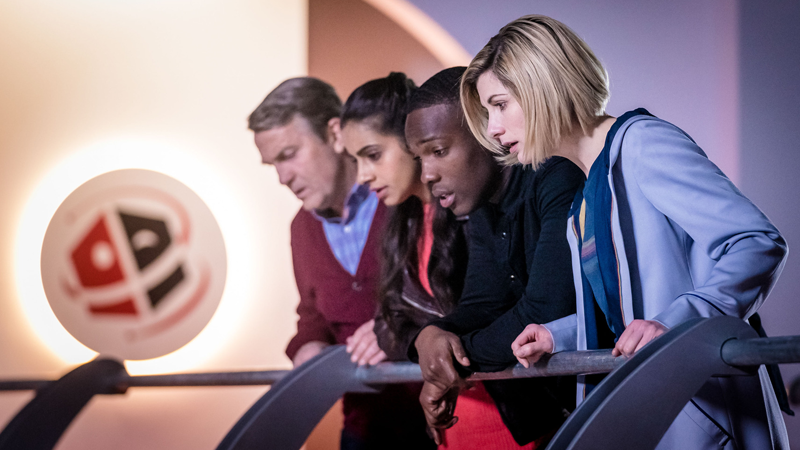 We’re a good chunk through Doctor Who’s 11th season at this point, and it’s clear that the show itself is still undergoing the same regenerative process the latest incarnation of the Doctor is undergoing. It’s less about the new look now—which the show still absolutely delivers on, this week managing to make a series of warehouses look beautifully epic in the way a warehouse never should—and more about the show finding what works and what doesn’t, and where it wants to be in the vast pantheon of things Doctor Who can be. It’s still cooking, just like the 13th Doctor. And in both respects, it’s been fascinating to watch this process play out at a much slower burn than it usually does on Doctor Who. “Kerblam!”—a deliciously dark double entendre of a title, as we’ll come to see—however, is something a bit different entirely: it’s really season 11's first attempt at trying to find a common ground between these two disparate approaches to Doctor Who’s particular take on socially-minded science fiction. The common ground it finds is in a well worn Doctor Who conceit—taking a very present concern and extrapolating it to its potential outcome in the far future. In this case, the concern is Amazon.com—well, literally the concern is with Kerblam, a fictional online retailer on the planet Kandoka that the Doctor and her friends are pointed to after a request for help shows up right in the TARDIS. But Kerblam itself is a galactic retailer with a majority-robotic workforce in a time of labor crisis for Kandoka, a business that’s all about insipid pencil pushers spouting people-positive buzzwords at the same time it denies its human workers the benefits of unionization, uses silicon valley technology to push said workers to extremely demanding levels for the sake of an endless chase for productivity, and then proceeds to also use that technology to slowly but surely replace those workers through convenient automation. All “Kerblam!” needed was a sinister bald billionaire to stalk around in the background looking for somewhere to “disrupt” with their new HQ plans and the pastiche would’ve been truly complete, but here we are instead with Not-Amazon. So yes, while “Kerblam!” arguably has just as potent a message—that maybe we shouldn’t trust billionaire retailers to solve literally all the ills of society while also getting us cheap crap on one day delivery—as with the other more “serious” episodes of season 11, it’s all one step removed, or given an extra layer of sci-fi artifice that softens the absorption of that message a bit. It’s not a petrifying devotion to the almighty algorithm crushing workers, it’s killer robots! It’s not the system that’s gone wrong, the system’s...actually grown a heart of its own and is trying to prevent some galaxy-scaled terrorism? And there’s plenty of fun to be had there—the Kerblam Man androids and their ever-smiling faces and robotically pleasant demeanor are a great creepy monster when you start realizing they’re making workers disappear, and the idea of killer bubble wrap (laced with millions of nano-bombs) hidden in packages is both chillingly prescient and a devilishly good spin on Doctor Who’s beloved pastime of taking something banal and familiar and turning it into something alien and petrifying. Throw in an unnecessary but hilariously Star Wars-ian adventure through a conveyor belt tube system for Ryan and Yaz, and “Kerblam!” reaches dangerously high levels of proper good Doctor Who-ness for much of its runtime. But in its chase to add some of the allegorical spectacle back into this message-driven season of Doctor Who, “Kerblam!” trips up right as it’s about to tie everything together. The climax reveals that Kerblam and its automated intelligence isn’t really behind the missing workers that brought the Doctor and her friends there in the first place, but instead the unsuspecting janitor Charlie—an undercover agent who, by hijacking hundreds of Kerblam Man delivery robots to deliver explosives-laden bubble-wrapped parcels to people on Kandoka, hopes to a) create a PR nightmare that forces Kandoka labor laws to increase the number of human workers and solve an economic crisis gripping the system; and b), more distressingly, kill millions of innocent people while doing so. Which...is a bizarrely anti-worker stance for Doctor Who to take out of its subtly-unsubtle critique of Amazon! But it’s not actually the point “Kerblam!” wants to make, and that’s its big problem. During Charlie’s reveal of his subterfuge, the Doctor makes the episode’s real point, that it is not the technology itself that is the cause of oppression—in fact, in Kerblam’s scenario, the system developed a heart for its mistreated human workers and sent the plea for aid to the Doctor in the first place—but the humans at the top of the chain using its benefits to exploit the humans at the bottom. Humans that we don’t actually ever see in the episode because the two pencil-pushers the Doctor does brush up against in her investigation also turn out to be caring people who helped investigate the plight of the missing workers Charlie nabbed as test subjects for his bombs. It doesn’t give a face to the actual villain of its story, so if you aren’t taking everything in, it ends up painting a unintentionally misguided picture. So unfortunately, instead of being the truly great episode of Doctor Who it came so close to being, “Kerblam!” is merely a mostly-good one that, in trying to find a blend between the message-driven storytelling this season has championed and the traditional sci-fi adventure allegory of Doctor Who’s storied past, trips up at just the wrong moment. But it comes so very close to bridging those two sides to Doctor Who that, in a season that’s still trying to find itself—much like the Doctor herself still is, trying on accoutrements and vernaculars of her past—that you can’t help but admire a lot of the efforts behind its muddled messaging, even if it never quite completes that bridge. And remember, if you want it...err, Kerblam it. The epilogue of the episode sees Judy and Slade celebrating that, in light of avoiding a cataclysmic act of terror, Kerblam’s employees are getting a mere two weeks paid off and a free shuttle back to Kandoka while the damage done by the explosive bubble wrap is repaired (which will take a month, so the workers don’t even get all that off!). Although Judy comments to the Doctor that she’ll make a proposal the company moves to being an organic-majority workforce—which, technically in shrewd business terms, that just means they only need 51 percent of the workforce to be human—it feels like less of a celebration and more of a dire warning that maybe Kerblam didn’t learn its lesson all that well. God, those employees need a union, ASAP. This episode has some very cute callbacks to past Doctors, with both the delivered Fez—the look on Jodie Whittaker’s face as she puts it on is priceless—and the nod to “The Unicorn and the Wasp” when the Doctor mentions her experience with Agatha Christie. In a series that’s done a lot to avoid those sorts of nods, it was a nice little moment. I’m honestly surprised how graphic poor Kira’s death-by-bubble-bomb was. The episode needed it for the stakes, but...oof, even if it wasn’t gruesome, it was actually still really disconcerting. A good, proper Doctor Who kill, that!